The creative side to woodworking is what we love most of all! Need a finial carved or a special part made to finish your restoration project? 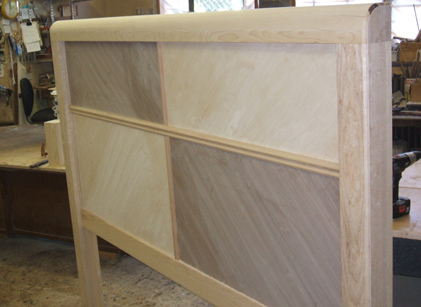 Do you need custom bookshelves or cabinets made; wooden dashboards for auto/boat restoration? Do you want a custom bookcase, chest or bed made? We do inlays, custom wood frames, side rails for beds, tables, office conference tables (made to order). We offer discounts to churches and other non-profits. 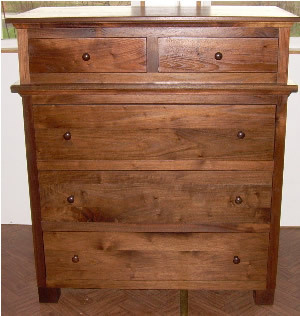 Tom's Furniture.net can design and make most any style wood creation. Give us a call and let us know what you need. The Custom art deco style headboard on the left was made with two different inlay panels for contrast, walnut and maple. Serving Cleveland and surrounding cities, west side: Berea, Lakewood, Rocky River, Westlake etc. East side: Willoughby, Euclid, Mentor, Beachwood, etc. Northeast Ohio, Akron, Coventry, Tremont -- all cities included.